In a mixing bowl, put the breadcrumbs and milk and leave to soak. Heat some oil in a pan and gently fry the onion, garlic and carrot. Take off the heat before they start to brown and add to the breadcrumbs mix, along with all the other ingredients. Mix together using your hands and shape into balls of whatever size you want. Heat up some more oil and fry them in batches. While they’re on the go, make a start on your tomato sauce – heat the olive oil in a large frying pan. You can use as little or as much oil as you like, but I prefer using a bit more than I would usually to fry onions. Make sure you have you tins of tomatoes already opened and put the garlic in the hot oil. Put the tomatoes in straight after – it’s important that you don’t let the garlic brown or burn as this will add a bitter taste to the sauce. Stir well and cook on a high heat until the sauce is thick. Season with salt and pepper. The brown sugar adds more sweetness. 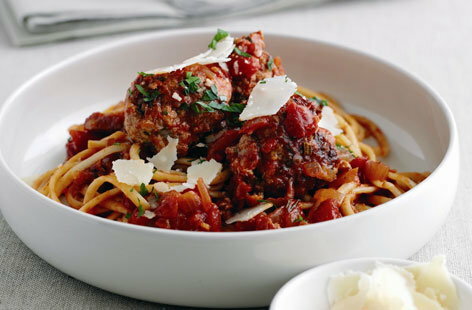 While you’re waiting for your sauce and meatballs to cook, get some spaghetti on the boil and when it’s all done, top the lot off with some parmesan. A lot of families are on a budget these days, but with some handy free UK vouchers, it’s possible you can conjure up a delicious meal with relatively little outlay. Our Tesco offer gets you £10 off when you spend £50 or more on your first online grocery, so you can afford to pick up even more value ingredients. And if you think your kitchen equipment isn’t quite up to scratch, browse through our homeware discount coupons - we’ve got a great Home and Cook saving that gets you £20 off a Tefal Expert Cook Cookware Set, which includes a top quality frying pan – perfect for browning off those delicious meatballs. So if you’re undertaking a new kitchen project, it’s always worth checking in with My Favourite Voucher Codes shopping vouchers first. Make sure you’re getting the most for your money whether it’s just a new cooking experiment you want to try out, or a brand new household essential.